The comprehensive eye exam will determine if you are a good candidate for the recommended procedure by uncovering any eye conditions that may impair your outcome. Also, your eyes will be carefully measured to achieve the optimal result from the chosen procedure. Your comprehensive exam will likely take an hour to an hour and a half. A variety of tests and exams will be done. Following is a brief overview. Whoever is doing the tests should explain them to you as they are done. None of these tests are painful. Visual acuity refers to the clarity of your vision. (Acuity is from the Latin acuitas, which means “sharpness.”) In other words, how well do you see? 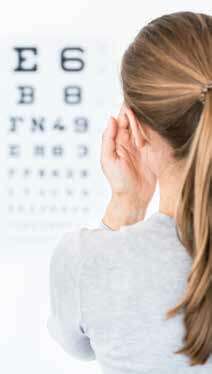 Your eye doctor will use the familiar eye chart most of us know, called the Snellen chart. It was named after the nineteenth-century Dutch ophthalmologist Hermann Snellen, who invented it. It consists of rows of black letters—very large at the top, very small at the bottom—against a white background. Each eye will be tested separately while the other eye is covered. The second number conveys how much your visual acuity differs from normal eyesight. If you have 20/20 vision, you can see at twenty feet what other people with normal vision can see at twenty feet. If your vision is 20/40, you can see at twenty feet what people with normal vision can see at forty feet. The higher the second number, the worse your visual acuity. At 20/200 vision or worse, we consider you legally blind without glasses. If your vision is this bad, you are completely disabled if you lose your glasses or contacts. Many of my patients had this problem. We measure the pressure in your eye to look for glaucoma. Glaucoma is a condition of elevated eye pressure that gradually damages the optic nerve. The eye is numbed with drops and a device called a tonometer touches the eye and measures the pressure inside. One of the side effects of LASIK and PRK is that your eyes can feel drier. The amount of tears you produce and the quality of tears will be evaluated in several ways. If your eyes are adequately moist before surgery, significant dryness should be a nonissue afterward. The doctor will examine the front part of your eye, called the anterior segment, which includes the eyelids, cornea, iris, and lens. Using a powerful biomicroscope, she will check for infection, inflammation of the eyelids, diseases of the cornea, and signs of cataract. Any of these conditions may disqualify you as a good candidate for vision correction surgery. The doctor will inspect the retina, blood vessels, and optic nerve at the back of the eye for signs of macular degeneration or nerve damage. This part of the exam is traditionally done by dilating the eyes and looking through a device called an ophthalmoscope. People don’t like having their eyes dilated because their vision remains blurry for hours. For most patients in our center, we are able to use a retinal camera to take a photo of the retina and nerve, avoiding the need to dilate the eyes. This technology is becoming more widely available. If your doctor determines that you are a candidate for vision correction surgery, he or she will ask you to sign an informed consent form. This is your written, legal consent to have the surgeon proceed with your vision correction surgery. Review this form carefully. It should not read like a legal document, but should explain clearly and simply the risks and benefits of the surgery. Sign it only after you understand everything on the form. Don’t be shy about asking questions. Signing the consent form doesn’t obligate you to have the surgery—you can always change your mind later.